Product information "Repp Stripe Silk Tie - Bottle Green / Burgundy - Handrolled"
Silk tie in classic stripe pattern in green, pale yellow and burgundy. A wonderfully versatile classic that works just as well with a grey business suit as with your trusted brown tweed jacket. Wear it with a white/burgundy shoestring linen pocket square, burgundy boxcloth braces and full brogues: voila. 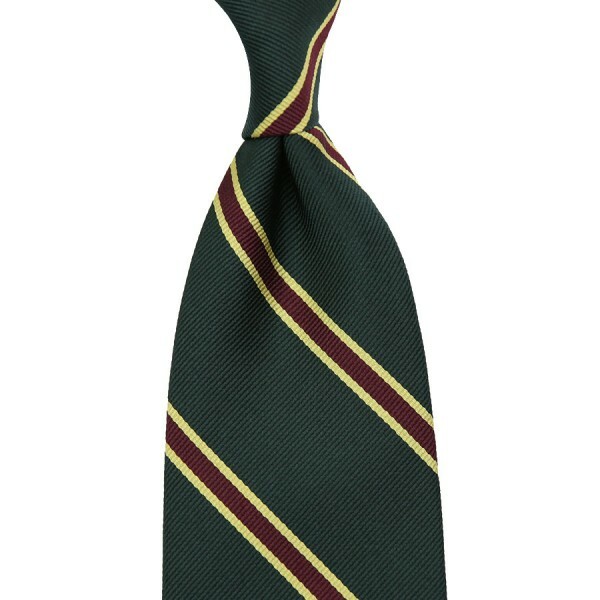 Related links to "Repp Stripe Silk Tie - Bottle Green / Burgundy - Handrolled"